Wondering where you can catch the Big Game on Sunday, February 4, 2018 at Disney World? We've got several great options for you. 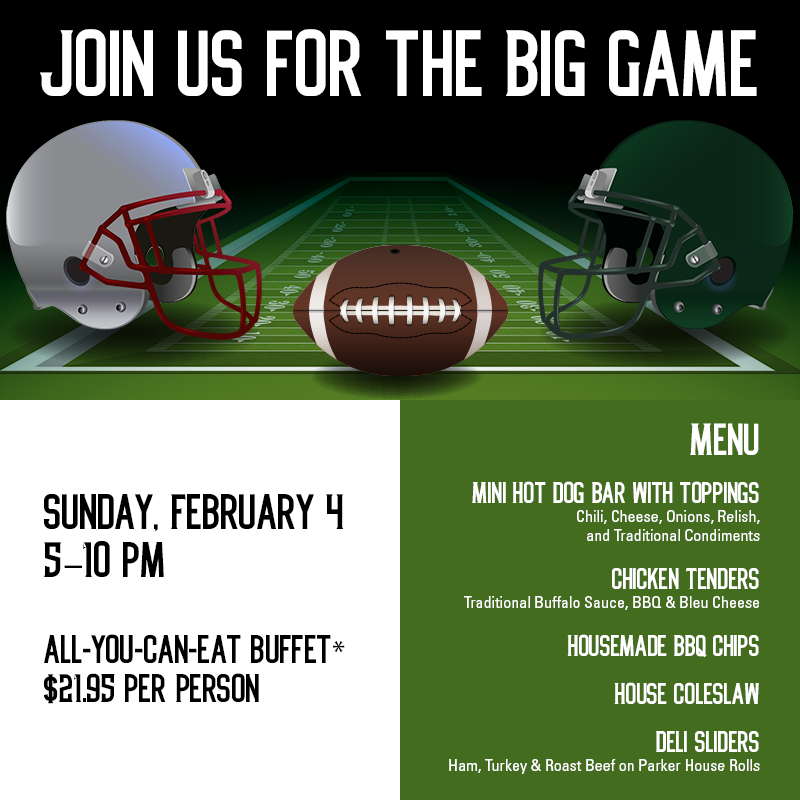 Rix Lounge, at Disney's Coronado Springs Resort is hosting a special event for the Big Game on February 4, 2018 from 5 - 10PM. The cost is $21.95 per person and the All-You-Can-Eat buffet includes a mini hot dog bar with toppings, Chicken Tenders, Housemade BBQ chips, House Coleslaw, and Deli Sliders. No advance reservations accepted. Free parking or use Disney transportation - take a bus to either Epcot or Disney's Hollywood Studios and then catch a bus to Disney's Coronado Springs Resort. This is a little off the beaten track and, as of today, they don't have the event posted on their website so crowds may be lower here. The game will most likely also be playing on the TVs in the other Disney hotel resort food courts and lounges. Splitzville will have the game on with sound up the second floor and on the patio and it will be business as usual. You can make an advance reservation, subject to availability, online through your "My Disney Experience" app or by calling 407-WDW-DINE. You cannot specifically request the second floor during the reservation process so that will happen first-come-first-served at the podium. This is a huge venue with lots of tables but expect a crowd. As of January 26, 2018, ESPN is completely sold out of for the Big Game so don't plan on going there. Instead, try the buffet at Rix Sports Bar & Grill at Disney's Coronado Springs Resort (information above). John T's Lounge will show the big game on their 7 TV's and they will have drink specials. The sound will be up though they do not have a surround sound system. You can take Disney transportation to Disney Springs and walk over to the Hilton hotel. The Lobby Bar at the Four Seasons hotel, with seating for 70 people, has not yet announced their 2018 plans other to say that "they will probably be doing something" and to call back (855-548-9127) closer to the date. No reservations accepted, no cover charge and you do not have to stay at the hotel to visit this venue. Food and drinks are available for purchase. While the Four Seasons is located on Disney property, you can't get to there using Disney transportation. You can take a taxi if you don't have your own vehicle. Parking is $15 but drops to $5 with restaurant validation when you purchase food and beverages. The lounges at the Walt Disney World Swan and Dolphin resorts are not planning any special events but are bringing in extra TVs for the game. These hotels are located in the Epcot Resort area. The game will be playing at the bar at House of Blues in Disney Springs but seating is extremely limited and the game will not be shown in the dining room. All of the Disney World Resort hotels have cable TV so you can certainly kick back and catch the Big Game from the comfort of your room. Pizza delivery is available and all of the rooms have mini-refrigerators so you can pre-order snacks and drinks from Garden Grocer and have them delivered right to your resort. You may also want to check with the lounge or pool bar at your resort to see if they'll be showing the game. Click here to learn more about Garden Grocer delivery services. The game will most likely also be playing on the TVs in the resort food courts and lounges. Planning a Disney vacation? You'll definitely want to subscribe to our free newsletter. You will receive a link to 45 great Disney World Freebies in your welcome note and several helpful “how-to” e-guides over the next week. Unsubscribe at any time.